The Avro Vulcan’s final appearance at RNAS Yeovilton Air Day on Saturday 11 July will include a special ‘V-Jet Formation’ flypast. The famed ‘V-Bomber’ will be joined by Naval Aviation Ltd’s de Havilland Sea Vixen and the Norwegian Air Force Historical Flight’s two de Havilland Vampires to present a unique four-ship classic British jets flight. 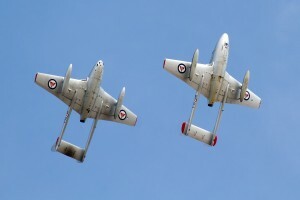 While the Vulcan and Sea Vixen’s joint flypasts were an outstanding highlight of Air Day 2011, the expanded formation will be a unique spectacle with the Sea Vixen leading the Vulcan with a Vampire on each wing. The Vampire and the Sea Vixen each played a major role in post-war Royal Naval aviation development, the full story of which RNAS Yeovilton has seen unfold over the last 75 years. With its pioneering aircraft carrier landings, the Vampire paved the way for all naval jet operations which followed. The Sea Vixen was, upon entering service, the Fleet Air Arm’s biggest and heaviest type ship-launched asset. 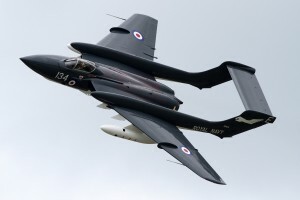 Recalling the times when Sea Vixens were based at RNAS Yeovilton, ‘Foxy Lady’ – the world’s only airworthy example – is a similarly appropriate inclusion. Its current markings are those of 899 Naval Air Squadron, replicating its exact look when based at RNAS Yeovilton during its Fleet Air Arm service days. 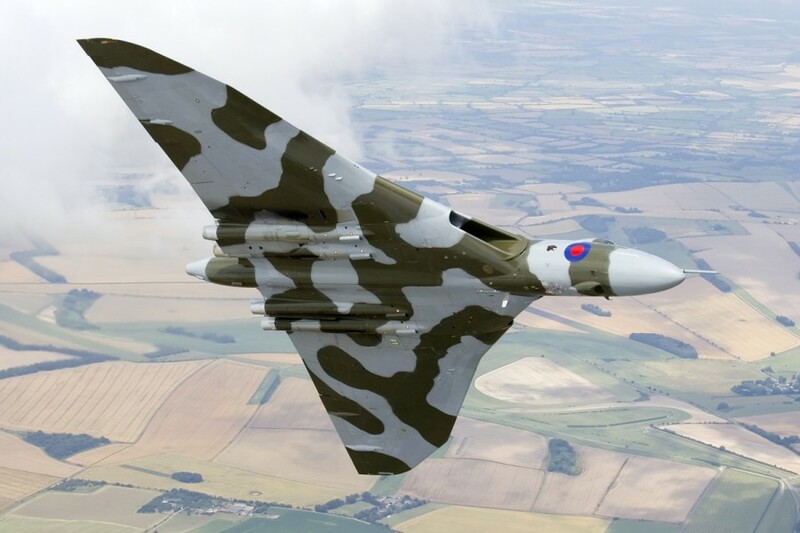 The thunderous, iconic Vulcan has participated in the majority of Air Days staged since its return to flight in late 2007. While its Air Day farewell will be a sad occasion for many, this exclusive classic jets link-up will give the Vulcan a magnificent send-off. NextAIRSHOW NEWS: Air Day all set for Take-off!